After the euphoria of qualifying for the long wore off, reality sunk in: Oh God, I actually have to run the long. 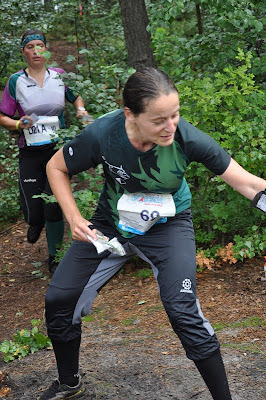 I tried to stay calm, telling myself I had already made my goal to qualify and I did know how to orienteer but I was so so nervous the whole morning before the start. I started with Magnus's last words of advice running through my head: "Take your time to do the first two controls well. It's a really long race to be annoyed all the way through!" Then I turned over my map. The first control looked so tricky! Despite the 375, 45m climb run to the start triangle, I still hadn't decided what what route to take. But good sense won out and I decided to play it safe and ran along the path. You can find the map (and final results) here. I had a few minor hesitations through the first four controls but I manged to make it through the tricky section relatively unscathed. That made all my training in France seem worthwhile as there is no way I could have done that a year ago! The second half of the race was really just a physical fight. Running up and down ski hills in that heat really cooked my brain and I made a bad mistake on the way to number 12, dropping 9 places. Oops. Lesson learned not to cut corners when you can't think properly! I was running with a few other runners through this section but never really managed to keep up with anyone for very long. Finally, I made it to the finish, after 1 hour and 56 minutes of running. I was so exhausted. Everyone was coming over and congratulating me on an awesome race, which was a little confusing. I didn't feel amazing out there so I thought they just were saying that for finishing; admittedly, finishing that course did feel like quite the accomplishment! It wasn't till I recovered a bit that I realized the mistakes some of the other women were making. You can relive the drama by watching the our GPS tracks. In the end, I was ecstatic to learn that I'd finished in 33rd, way beyond what I'd dreamed was possible. 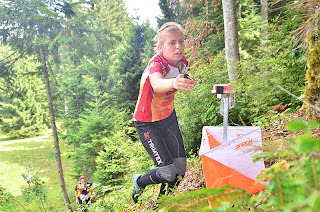 This WOC everything really came together, with terrain that suited me, having tonnes of supporters there and just having lots more orienteering experience. 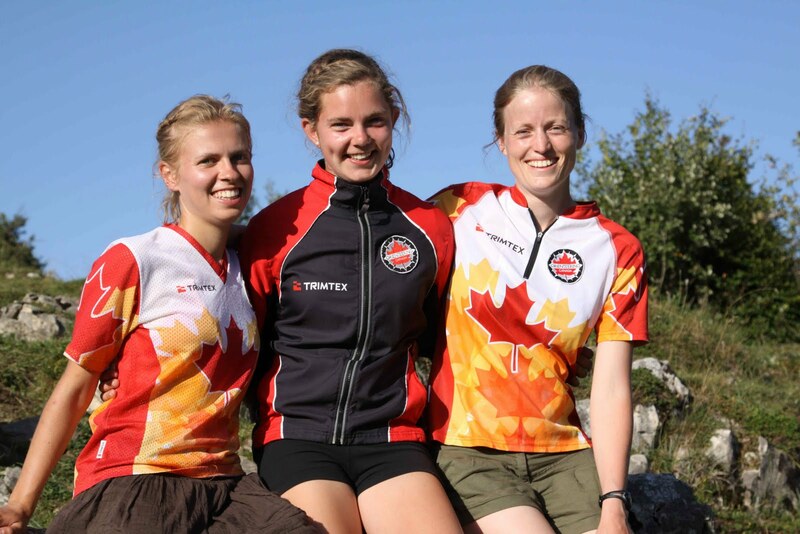 Then our team's relay result was really the cherry on top: first ever top-half finish for the Canadian women! Such an awesome week and now I'm really excited for the future! 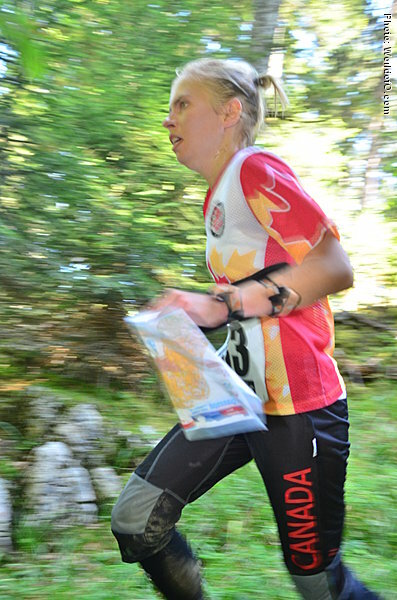 I was fortunate enough to get the opportunity to race in my first World Orienteering Championships in Savoie, France. Although the Long was not the race I particularly wanted a start in, I made the most out of it. Of course I would have preferred to have a start in the Sprint or even the Middle before the Long but it just didn’t work out for me. I did not know what to expect but I knew it would be really tough to qualify or even crack the top 20. 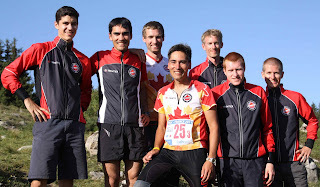 Saturday August 13th came and my first WOC race the Long Distance Qualifier dawned on me. The first start was at 13:10 and I started at 13:28, so I knew it was going to be hot, hot, hot even though the start was around 1400m above sea level. 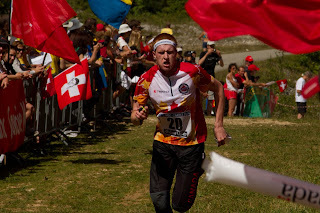 I knew that there was going to be a fair bit of open meadow running based on the course notes and in order for the winning times to be accurate which made me feel better about the race knowing that there would be some less technical parts with faster running. One of the things coach Magnus was stressing was compass, compass, compass, always look at your compass. It probably was the best advice he could have given myself and the team. Before my start I was constantly telling myself compass, compass, compass and to take it easy and safe to the first control which I did. I nailed the first control and got into a nice rhythm early on and kept it going until the course got into the more tricky terrain just over half way through. By this time I was getting tired after the huge climb going to control #7 which turned out not to be the best route choice. This is when the small mistakes started to happen and my concentration was fading. I was having trouble judging the distance in the forest and I consistently was not going far enough. On my way to control eight I was stung by 3 to 4 wasps or bees which was irritating but my adrenalin was so high that I did not notice it much at all. Immediately after it happened the first thing besides some profanity was I hope Thierry is not coming on this exact route haha. Later in the course Olle Boström the young Swedish star came blowing by me heading into control #10 only to stop shortly after and ask me if I was looking for code 72. This stunned me because someone of that calibre asking me where I am going is unusual. I could maybe see someone else asking me but a Swede, no way. Anyways I told him I was looking for 72 and we both continued on to the same control and he soon left me in his dust. By the time I reached the finish chute I was physically and mentally wrecked but somehow managed to find some more energy since there were so many people cheering. Nothing can compare to the feeling of running down that finish chute despite how exhausted I was. I managed to make it back with no major mistakes which was one of my big goals. I felt like I had a pretty good race but it did not show in the results like I thought it would. I think I got stuck with one of the hardest heats (Heat B) because if you compare my time to the other heats it should have slotted me into about 26th or 28th place not 30th which I ended up in my heat. I guess it does not really matter because I would not have made the final either way. Thierry Gueorgiou crushed everyone in my heat winning by over six minutes. I guess you could say I was 34 minutes behind the World Champion that is about the only claim to fame I have. Besides taking a bad route on the long leg and losing some time here and there I think the race went as well as it could have for me considering my training and running speed. Of course I could have had a faster race with some better route choices and fewer mistakes but can’t we all say that. 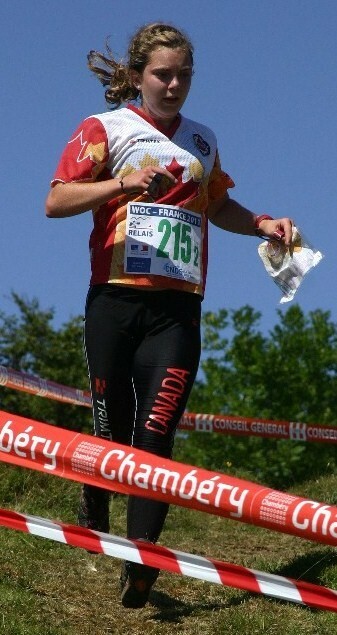 I will remember my first World Orienteering Championships in Savoir, France, 2011 for the rest of my life. Directly after the relay we gathered in the baking sun to take some team photos! 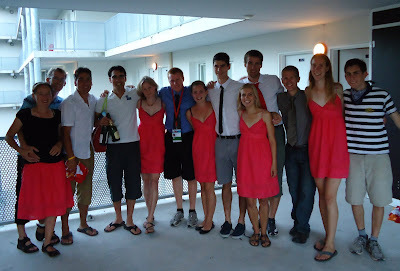 After that we rushed down to town to get ready for the banquet. Here is a video we shot on our second day in France. We weren't able to upload it with the slow internet at the hotel. The quality isn't great, but hopefully it gives those who weren't there an idea of what the terrain is like. Enjoy! As a pre-face to this entry, I'd like to touch on the distinct lack of athlete reports from their respective finals and relays from WOC week. Unfortunately, the internet at our hotel was highly suspect, and the finals days proved to be very long and very hot. Over the next few weeks and as the season winds down, we will gradually be posting our individual experiences from these races, from the much talked about Sprint qualification to Carol's epic marathon of a long final, to the madness that was the women's relay. There is much coming down the pipeline! Although the initial fervour of this year's WOC is slowly dwindling (though some debates rage on - see AttackPoint), its time to start looking forward again. And, it just so happens that NEXT year's WOC is a scant 150 km for this year's WOC! Carol and I stuck around for a week after France to do some relaxing, some sightseeing, and a little bit of orienteering. Our initial plan of visiting the Olympic Museum in Lausanne was thwarted once we determined exactly where the embargoed zone was, so we turned a hard left and headed back into France, the Jura area. Now, to be clear, a large portion of these days have involved lying in the sun (or shade) on the beach of some lake. Naps occurred. Some food with questionable health qualities were consumed. But, it has not been all lying around. We have "climbed" Mt. Jura, a massive 1500 metre peak which the tourist office says would take around 4:40. We made it up and down in 1:45. Tomorrow, I head back to England to get in on the City Race action, with Sheffield and Lincoln next weekend, and London the weekend after. Carol is going to head to Switzerland and will likely do some more WOC specific training. Finally, although the first two days we stayed in a pleasant and cheap hostel, last night we found some cheap as free accommodation. Can you guess where we are staying based on the picture below? But our athletes produced great results all week and we felt better and better as we approached the last day of the program with the Relay on Saturday. We talked already from the first day that our big goal this year (and coming years) was to produce one top-16 result (top-half if less than 32 participants) and we knew that our best chance was the Women's Relay. Carol Ross took the first leg and her job was to repeat her great relay performance from last year and that's exactly what she did! 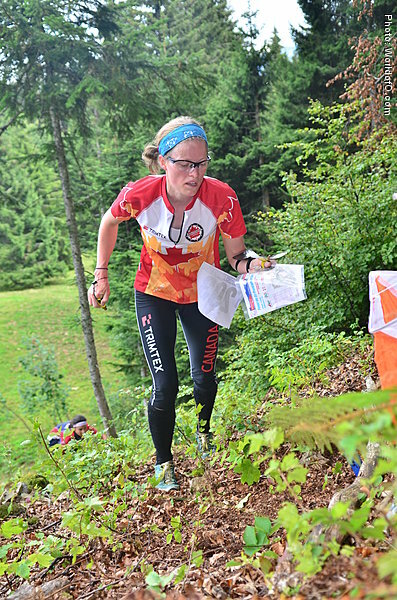 She kept mistakes to a minimum in the very difficult terrain and came in with a pack of runners only 7:30 down from the leaders. Emily Kemp went out on the second leg with a focus on her own run and to let the other teams make mistakes. 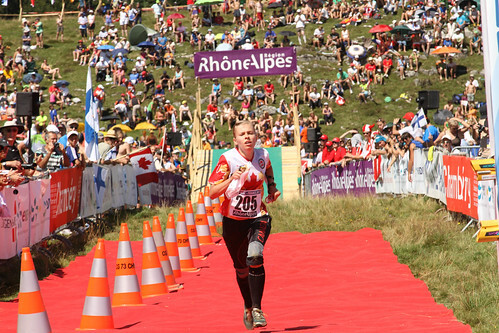 She put in one of the best performances in Canadian WOC history, losing only 40 seconds on the lead, moving the team up to 11th position and giving Louise Oram a huge gap down to the chasing teams. Louise's job was again to focus on a clean run and she did that brilliantly. She did not stress and always made sure she was on track and she was able to bring the team home with a first ever top-half result for the Canadian Women at WOC. A fantastic team effort! This means that Team Canada is starting to get on track for Sport Canada Elite funding, which would mean a huge step forward for the High Performance Program. We need a few more years of these type of results, but it is clearly within reach! Thanks for your support this year and keep checking this blog for team photos later this week (and perhaps one or two pictures from the banquet and party as well)! Magnus and Andrea commented last night that with Team Canada doing so well and making every final this year, its really screwing with their France vacation. Instead of going off and sightseeing while the rest of the orienteering elite were fighting it out in the finals, they had to go and look after athletes racing the finals. What. A. Pain. And, today its Carol's turn to battle it out, in her first final in the Long. She is slated to start at 12:43 France time, which is 8 hours ahead of my time zone of MST, so.... translate it to your own accordingly. As usual, live results, GPS tracking, and possibly some video feed is available at http://live.woc2011.fr/index.php?id=long-distance. Louise Oram finished 37th in the sprint final today and Will Critchley finished 38th. Today was the first final event so it was nice to finally see the big screen at the arena today. The start and finish were also right there. Here's a pic of Will on the screen just before his start. And you can see Will in the bottom right of the pic. I started in the last set of three, with only one German girl two minutes behind. I had a good first two controls (some hesitation leaving the trail to the 1st), and read ahead to have some idea what to do on the longer legs when I came out to the trail to go around to control 3. I hesitated once in the woods near 3 when I suddenly found myself in an area with several other women (it was a forked control for the different heats but all three controls were near each other). I then went the right direction to the next control, but misread the contours in the circle and botched the attack. By then I was running with Niamh from the Irish team and a Serbian. I took the route along the smaller trail slightly to the left of the line towards 5. Niamh went right in the last depression, but the Serbian stayed with me. I got to the control slightly before the others. After that it was out to the clearing and crawling up the hill to 6, where a several photographers were positioned. I took the straighter route hopping from small trail to trail towards control 8; I had wondered if it was better to go north to the trail when initially looking at the leg but opted for the more aggressive route. Long Qualification - 7th time lucky! After running seven qualifiers in previous years, I qualified for my first WOC final yesterday! I was cautiously optimistic about my chances this year. I definitely felt I was best prepared this year, especially after living in France and having a chance to experience the terrain ahead of time. At the same time, I was really, really nervous before starting yesterday. But my training, the motivation from my nervousness and a bit of luck all came together yesterday and I finished in 14th position in my heat! The start at WOC is absolutely calm. When the start official took his hand off my shoulder, I just tried to focus on Magnus's parting advice to pay attention to my compass all the time. The start of our course was in the meadows and quite easy, which helped me get into the feeling of racing. Then came the long route choice. I made a very poor choice here but fortunately it wasn't fatal and I learned what not to do in the final! From control five on we were in the tricky French forests we've been hearing so much about. I was a little scared of the sidehill legs but being cautious paid off here and I made it safely through the forest controls. Here's a photo of me dashing out of the forests towards the finish. The wait at the end was so agonizing as I had no idea if it was good enough. I told my boyfriend I was going to cry no matter what happened! But I made it and I feel so elated and relieved at the same time. The only bad part is that Louise just missed out after such a great run. Now it's time for to get ready for the middle qualification. The long final will be held on Wednesday, August 17th. You'll be able to follow my little gps dot from the WOC website. Thanks for following along and cheering for us! We have arrived safely in France and have several good days of training behind us. The team is in good spirits and we are optimistic about the challenging terrain. With the first races coming soon, we have many blog posts in the works with maps and videos of the French terrain. In the mean time, Robbie and Patrick kept busy on a rest day ahead of the Middle Quali on Sunday. The day started out with a good sleep-in, followed by a nice morning jog along Lake Bourget and breakfast on the balcony. We decided to give you a behind-the-scenes look at our accommodations here in Aix-les-Bains. Here are some of the daily choices we are faced with as part of our daily grind in the south of France. Bohemia 5-day - Czech out those rocks! Each time I come to a new place to compete, I resoundingly declare it couldn’t get any crazier than that. First it was Sweden with and O-Ringen with 16,000 people competing in the forest at once. Then it was the London City Race, running around downtown London, dodging tourists and discovering all the side streets and passageways of London. Then it was the middle of Beijing, island hopping at the Ruins of Yuanmingyuan. However, the Czech Republic definitely seems to have taken the crazy cake. I got into Prague on Thursday afternoon to race the last three days of the Bohemia 5-day event in Novy Bor, GVOC member Andrea Balakova’s hometown. It’s a cute place, lovely scenery, nice houses, and cheap ice cream and beer available with these simple tokens that cost about $1.15 (Andrea says its actually a 20 crown piece, I’ll stick with ‘ice cream token’). Friday morning was my first race and first experience in this sandstone terrain. After two days of long distances, this race was a shorter one, with M21 Elite doing 3.8k with just under 400 metres of climb. This race was touted as being in the ‘city of rocks’. I scoffed since I’ve seen rocks before. How hard can it be? Well, I picked up my map and ran towards the start triangle, and HOLY CRAP LOOK AT THE SIZE OF THOSE ROCKS. Any initial plans I made in those first 30 seconds went completely out the window after discovering that little cliffs on the map were 4-5 metres high, controls were located on single rock features that had measures like 8 metres, and controls were located in narrow passages between huge rock faces. And you think all of those things would be pretty distinct, but there’s also several thousand of them. Everywhere. And there were people looking around every rock, having discussions, shouting to each other, it was O-Ringen madness in a very small area. Oddly enough, during stage 4, I discovered that I would rather be in the rocks than in flat forest. It was a brief respite from the craziness, but I made more mistakes looking for my arch-nemesis, the cup depression, than I did looking for a 2.3 metre boulder in a sea of boulders. There’s no doubt that doing all 5-days of this event would have been absolutely physically brutal. 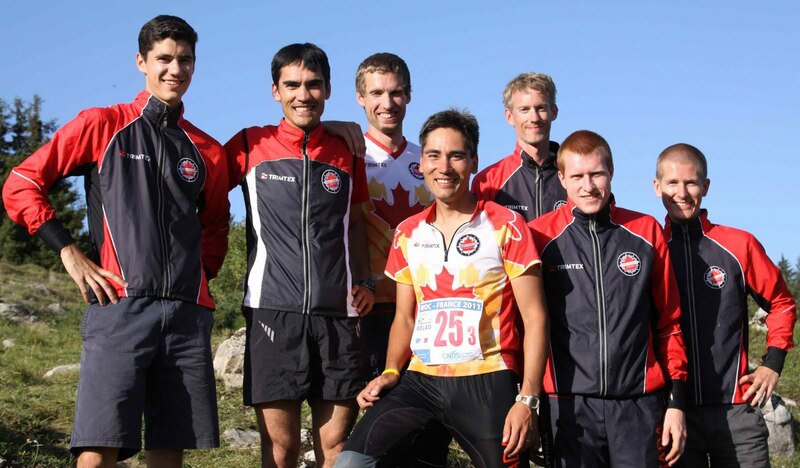 The Men’s Elite did a total of around 40k and 1700 metres of climb. Magnus marched in for Stage 4 and 5, finished second in H35 on 4 and de-throning the “Russian Rocket” in the final stage. That guy was so far ahead only one other person made the 1 hour cut-off to participate in the chase start. Andrea managed to get through all 5-days alive , and actually pulled out her best performance on Day 5 in D21A, climbing from 11th to 8th in the pursuit start and having the 4th fastest time on the stage. I believe she’s going to propose next year it become a 12-day event, because then she’d definitely win.